Home > About Council > Work for Council > Work Experience and Work Placement Opportunities > Which department would you like to work in? Opportunities for Work Experience and Work Placement exist within a diverse range of programs at the Swan Hill Rural City Council. The Aged and Disability Program is a quality service that assists the frail, aged and people with disabilities to maintain their well-being, independence and quality of life while living in the comfort and security of their own home. The Swan Hill Regional Library has a static library in Swan Hill and a Mobile Library that visits nine towns in the Swan Hill municipality and seven towns in neighbouring council regions. The library service provides free access to information and recreational resources, online resources through the Library’s website, access to computers and the internet, meeting room and space for use by the community, baby rhyme times, story times and a local history collection. Quality child care supports parents in the workforce and in the long term, benefits the broader economy, locally and nationally. High-quality childcare services, such as those provided or sponsored by Council, contribute to the improvement of disadvantaged children’s lives. The Youth Support Officer is responsible for planning, developing, coordinating and documenting a range of youth projects and programs for young people aged 12 to 25 who live in the municipality. The program seeks out performances, exhibitions and artistic events, promotes local individuals and groups to perform, and promotes events to broaden the cultural perspective of everyone within the municipality. The Swan Hill Town Hall Performing Arts and Conference Centre (PACC) is a very versatile, multipurpose venue. It is used for a wide variety of events including meetings, conferences, seminars, trade fairs, concerts, weddings, debutante balls, dinners, birthday parties, Council meetings, schools performances, training and theatrical performances. Lighting requirements like patching lights, gelling lights and rigging lights. The Commercial Services Department is responsible for ensuring Council’s procurement practices achieve best value for money, risk management, management of insurance policies, claims and incident handling. The department also manages the Tower Hill residential development, Council-owned caravan parks and the acquisition and disposal of Council properties. 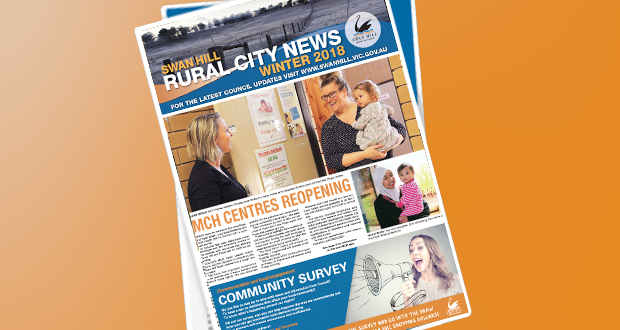 Customer Service is the face of Swan Hill Rural City Council. The Customer Service Department might be addressed with anything from a query or a proposal to improve Council services, to an expression of satisfaction or dissatisfaction. The Customer Service staff quickly direct residents to the most appropriate staff member to answer individual enquiries. This department is responsible for staff recruitment, training, industrial relations, co-ordination of staff performance reviews, provision of uniforms, involvement in occupational health and safety, WorkCover administration and general administrative functions including management of Council’s Scholarship Program and placement of Work Experience and VET students. Information Technology Services (ITS) provides a range of services directly to Council staff and Councillors as well as indirectly to the Swan Hill community. The services are broad and cover the support of the desktop computing environment, application servers, telephone systems and computer network. The Media and Events unit provides overall public relations and events support across Swan Hill Rural City Council, ensuring messages regarding Council activities are communicated to the public through the media and other means, including newsletters, advertising and the Council website.The Media and Events Unit also provides support for a number of events during the year, including Pioneers Week, Tour of the Murray, Senior’s Festival Week, Go North Arts Festival, New Year’s Eve and any other events that might arise during the year. The records management section of Council is responsible for the capture, registration and maintenance of the bulk of Council’s records. The section processes more than 65,000 documents annually, and is responsible for managing about 6,900 boxes of archived records. The Building Department provides a statutory building control service to ensure the structural efficiency, health, amenity and energy efficiency of buildings. They work with developers, home owners, builders and the general public. The program liaises with community, sports and recreational clubs, other organisations and residents to ensure that community facilities are developed and managed in the best interests of residents. General word processing including typing of minutes, letters etc. Economic Development is a key function of Council and aims to expand the size of the local economy and create wealth for the whole community. Council’s Economic Development Unit plays an important role in assisting with this economic growth. The Economic Development Unit undertakes a range of projects to boost employment and stimulate the local economy, It is based at the Swan Hill Region Information Centre, which provides services to both visitors and local residents. The Environment Unit protects and enhances the natural and living landscape. Objectives of the Environment Unit include educating and encouraging the community and officers to embrace sustainable living practices, protect native vegetation and restore and rehabilitate the landscape, implement sustainable water practices and much more. The Pioneer Settlement was Australia’s first outdoor museum and heritage park, established in 1963. It aims to tell the story of the Mallee and its people through a range of interactive experiences. The Pioneer Settlement attracts about 40,000 visitors per year and also provides a venue for functions and community programs. The Planning Unit is responsible for administering the Planning and Environment Act 1987 through the Swan Hill Planning Scheme, as well as other related legislation such as the Subdivision Act 1988. Services include offering planning advice and property information, processing subdivision plans, assessing planning permit applications, representing Council at VCAT hearings, and enforcing planning permit conditions and Planning Scheme provisions. Regulatory Services staff, known as Authorised Officers, ensure public adherence to local laws, animal and stock control, parking meter maintenance and disabled parking permits. They are also responsible for Arbovirus control and managing the recreational waters of Lake Boga. Asset management guides the planning, acquisition, maintenance, renewal and disposal of assets and aims to maximise asset service delivery potential while minimising related risks and costs over their entire lives. Assets managed by Council include roads, bridges, footpaths, parks and playgrounds, buildings and land – just to name a few. Fleet is responsible for the effective operation of Council’s fleet of motor vehicles and plant. Its responsibilities include the selection, purchase, maintenance and operation of the Council fleet, as well as the operation of the mechanical workshop where service and repair works are carried out, metal fabrication for Council amenities, as well as the responsibility for the maintenance and operation of flood and drainage pumping units throughout the city. Within Fleet, the experience will largely relate to the workshop. Works maintains Council’s various assets and services such as roads, drains, parklands, recreational reserves, tip operations and aerodrome maintenance. They also carry out minor works for the private sector. Works operations are located at two depots, the southern area with 38 staff in Karinie Street, Swan Hill and the northern area with six staff in Moore Street, Robinvale. Administration and Management are located at the Karinie Street depot. The Engineering Department arrange tenders and quotes for physical infrastructure, capital and major works projects for example, roads, drains, parks and some buildings.Staff issue Road Opening Permits, manage the Swan Hill and Robinvale aerodromes, check engineering components of planning and building applications and oversee the technical aspects of Council-owned swimming pools in Swan Hill, Robinvale, Manangatang and Nyah. The objectives of Council’s Waste Management services are to:Provide Council with a safe, efficient and effective domestic garbage collection service,Collect garbage from any approved residential premises or place located in the ‘garbage collection’ district on a weekly basis,Collect recyclable material from approved residential premises or place located in the ‘garbage collection’ district on a fortnightly basis.Council’s waste services also include education campaigns and projects to assist and support residents’ practice of efficient waste disposal by using the Reduce, Reuse and Recycle process. The Executive Team provides administrative support for the Chief Executive Officer, Directors, Swan Hill Rural City Council Mayor and Councillors.